The latest to face the chopping block are its next generation email app Inbox and the Google+ social network. Inbox is an odd one. It was never mainstream, and served mainly as Google’s testing ground for new ways to manage email. Many of its features have found their way in to the main Gmail app, but nevertheless it had a devoted following and there are many users who’ll be sorry to see it go. To be fair to Google, many of the services it’s killed have found their way into other, newer services. It’s hardly fair, for example, to say that Google killed “Google News and Weather” when the features were simply merged with Google Play Newsstand. Others, such as Google Showtimes – a dedicated search page for movies – have been subsumed into the main Google search engine. 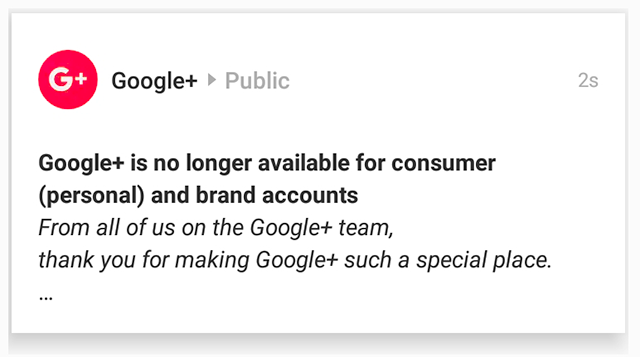 Google+ is a different story, and its death feels more significant. It started out as Google’s attempt to compete with Facebook in the social media space. It had some good features – the concept of circles, for example, to distinguish between personal and professional, or family and friends. Circles make sense as they mirror the way we manage our offline lives – there are things we share with friends that we wouldn’t dream of discussing at work, or even with family. It made privacy easier to manage than Facebook’s more convoluted system. Unfortunately it never took off. To be effective, a social media network needs users. People post where their friends post, and Facebook already had a defacto monopoly on their attention. Google couldn’t convert the millions of Gmail users into avid Google+ users. 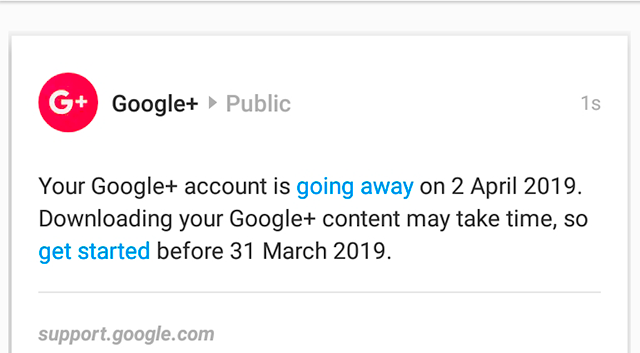 Google then attempted to force Google+ on to its users, by tying it in to other services until it decided to backtrack on the decision. The final straw was a bug that allowed third parties to access user profile data. Core services that are part of the G-Suite offering are probably safe, as is Android – for now. Anything else is a risk. In some ways I applaud Google’s approach of throwing stuff at the wall to see what sticks, as it’s a way of getting innovation out of the door. Unfortunately, Google’s size means that the critical mass of users needed for a service to stick is pretty big – Google isn’t interested in running niche services. Unfortunately it’s not averse to buying those niche services and then shutting them down. When I started writing about technical stuff, I actually considered posting on Google+ instead of running a blog. Social media seemed like a more accessible way to get my writing out there and possibly get some engagement without the overhead. I still think that’s true, which is why I tweet about new posts, and why I’ve switched off comments in the blog itself – keeping on top of anti-spam defences was becoming too much of a chore. Google+ felt better for longer posts than, say, Facebook and could’ve been a better option that a dedicated blog. I’m glad I didn’t go down that route. I then ran the blog for a while on blogspot, which is also owned by Google. I don’t think Google is about to kill off the blogger/blogspot service, but you never know. In the end, the only way to guarantee an ongoing service is to pay for some hosting and run it yourself.